The controls for 3DS can be customized. The default controls are listed below. Press left or right to run in either direction. Hold up to aim your bow skyward. Also press up to climb ladders in the fortresses. Hold down to squat and duck below enemy bullets. Also press down to climb down ladders in the fortresses. Jump—hold down to jump longer. Fire an arrow from Pit's bow. Begin a new game, pause the action mid-game to view the subscreen. Switch between using Pit's bow and using hammers to break Centurion statues. Total: The total accumulated score up to the completion of the last stage. Score: The number of points you have accumulated on the current stage. Heart: The number of hearts in Pit's possession, 999 maximum. Endurance: Pit's current vitality in contrast to his maximum vitality. Strength: The number of arrows indicates Pit's level of offensive strength. Weapons: Your current collection of enchanted weapons obtains from the Trial Rooms. Treasures: The number of sacred treasures collected so far. 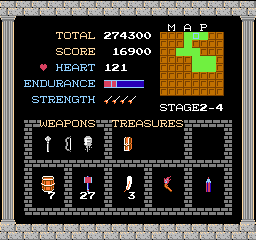 Other information includes; the current stage, possession of a Bottle of Life or the number of Bottles held in a Barrel (8 maximum), number of Mallets, number of Angel Feathers, possession of the map, pencil, and torch for fortress mapping (displayed in the upper right corner), and possession of the credit card. Pit begins as a young boy trapped in the underworld. He has been tasked by Palutena, the imprisoned Goddess of Light, to defeat Medusa, the Goddess of Darkness. Already wielding the Three Sacred Treasures (the Pegasus Wings, Mirror Shield, and Light Arrows), Medusa commands an army of terrible power, which threatens Angel Land and Palutena's Palace in the Sky. Gifted with a magical bow, Pit sets out to reclaim the Three Sacred Treasures and restore peace to Angel Land. Pit is loosely based on Icarus and Eros (also known as Cupid), figures from Greek mythology. The clothes that he wears and the fact that he is an angel resembles Perseus, Bellerophon, and Hercules, the last also being an archer. His character design has changed very little over the years, having always included elements associated with classical antiquity (such as the chiton and sandals). His primary weapon is the bow and arrow. There was once a kingdom called "Angel Land." This kingdom was ruled by two beautiful goddesses, Palutena who administered light and Medusa who ruled darkness. Palutena lived in the Palace in the Sky and administered light so that man could live in happiness. And bathed in this light man grew food and lived in peace. However, Medusa the goddess of darkness was different. Medusa hated mankind. She took great pleasure in drying up the crops that man took great pains to grow and in turning people into stone statues. In her anger Palutena changed Medusa into an ugly monster and banished her to the deep, dark Underworld. For being changed into this ugly monster and forced to live in the Underworld, Medusa promised to take over the Palace in the Sky where Palutena lived. So great was Medusa's anger that she joined forces with the monsters and evil spirits of the Underworld and Medusa's army soon began to surpass Palutena's army in strength. Soon a war between Palutena and Medusa began. Medusa led a surprise attack on Palutena's army which could barely fend off the attack. Palutena's army suffered major losses and was heavily defeated in the final battle. What's more, Medusa's army took Paletuna's source of power the Three Sacred Treasures - the Mirror Shield, the Arrow of Light, and the Wings of Pegasus - away from her. Almost all of the warriors in Palutena's army were turned into stone statues and Palutena herself was imprisoned deep in the Palace in the Sky. The peaceful realm of Angel Land came to be inhabited by foul and terrible monsters and was turned into a land of darkness ruled by the wicked Medusa. Locked in the depths of the Palace in the Sky, Palutena's strength was drained to its last. As a last resort, she sought the help of the angel youth Pit who was being held prisoner locked in a deep dungeon in the Underworld. The Centurions are the royal guards of Palutena. During the battle for Angel Land, they were turned to stone by Medusa. They were then placed around fortresses by Medusa as decorations. When Pit stumbles upon a statue, he can crack them open with mallets and rescue the Centurion inside. They will come and aid you in battle against the fortress boss. However, they can only withstand one hit before they are defeated. This page was last edited on 22 June 2012, at 16:15. This page has been accessed 21,667 times.